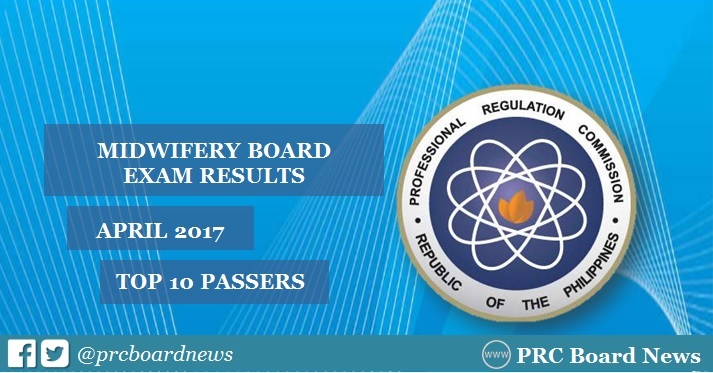 The Professional Regulation Commission (PRC) and the Board of Midwifery released results including the top 10 passers or topnotchers for April 2017 Midwife board exam. The examination was administered on April 10 and 11 in the cities of Manila, Baguio, Cagayan de Oro, Cebu, Davao, Iloilo, Legaspi, Pagadian, Tacloban, Tuguegarao and Zamboanga. On this page, the names of topnotchers, their school and corresponding rating on recent board exam will be posted. In the same period last year, Marilou Jumalon Montefalcon of Christ the King College - Gingoog City topped the board exam with 90.50% grade. It was followed by Mary Reciel Danice Sinforoso Bernarte of Bicol University - Tabaco, 90.00%. In April 2015 exam, Catanduanes State University-Virac graduate April Kay Vargas Calderon aced the board with 89.75%. Bicol University - Legazpi alum Carlo Cervantes Vibar ranked second with 88.95%. Which school do you think will produce the highest placer for April 2017 Midwife board exam?